The past few years have embraced the “craft cocktail” movement by storm. Across the land, bartenders and hosts are displaying their creative genius experimenting with handmade infusions, fresh-squeezed and mashed juices, exotic spices and flavored, purified ice. Perhaps 2013 will be the year of the “craft punch bowl” scene. I Love Lucy’s punchology skills! But it’s fun to include an out-of-the-ordinary potable at parties — especially during the holiday season — and a fresh introduction to the punch bowl caught my attention: My son’s girlfriend, Lucy Carnaghi, contributed to a recent dinner party by bringing her Holiday Sling Punch. 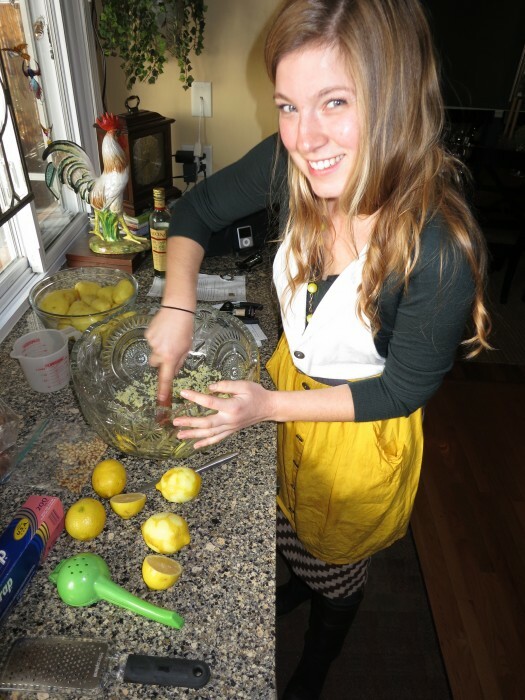 Lucy’s mixology credentials include barending at Zingerman’s Roadhouse and Detroit’s Sugar House, and I’ve had the good fortune to bask in the warmth of her marvelous skill set for the past couple of years. Her recent efforts are focused on inventive “punchology”. She recommended I read an interview in The New Yorker with David Wondrich, mixologist, historian, and author of “The Punch Bowl: The Delights (and Dangers) of the Holiday Bowl”; I quote their thoughts and expertise to further enlighten. – Mr. Wondrich: Punch began as a sailors’ drink, where everyone onboard—officers and ordinary seamen alike—would partake together. It didn’t always exercise that equalizing force, but it’s inherent in the format. A bowl of punch is a group effort, and people who choose not to partake find themselves at odds with the community. Most will put aside their standoffish ways and join in, but if they can’t or won’t, the nice thing is that nobody cares: all the more punch for us. – Lucy: I’ve personally found punch to be an easy way to entertain. It’s festive, and a smart way for the host to stay sane and keep everyone with a drink in their hand. – Mr. Wondrich: Since you’re making the punch before anyone shows up, the stress level is far lower than making cocktails for your guests. – Lucy: Punch is a conversation piece, a central narrative for the party, and literally, a watering hole for the guests. It relaxes and lubricates the party just enough without the worry that someone will be wearing the lampshade. – Mr. Wondrich: The Cocktail is an unforgiving drink, with a very narrow margin of safety. Two martinis and you’re fine; three and you’re boarding the red-eye to Drunkistan… Since punch is weaker than cocktails you generally get a little bit of time in which to determinedly ignore the warning signs before you find yourself befuddled. – Lucy: Most people haven’t had punch in years, and it’s a great vehicle for reintroducing us something adult, rather than something that’s been made with pop and fruit juice. The ingredients must be fresh and flavorful, and I’d avoid using vodka. I think it’s boring, and I relish the chance to experiment and tell my guests, “Just try it.” When they tell me they love it, I tell them it’s gin, or whiskey, plus a host of other things they would never dream of drinking. 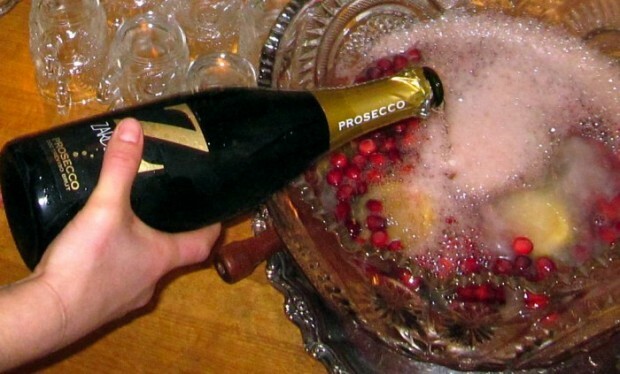 Punch is communal and celebratory — a low-stress way to usher in the holiday season! Place zest and juice in a large punch bowl. Stir in gin, cherry heerring and ginger syrup. Add sparkling wine, and sparkling water; stir. Add nutmeg and stir. Drop in ice ring. Grate nutmeg over all and serve. * Cherry Heering, a Danish cherry liqueur invented in the late 1700s or the early 1800s by Peter Heering. It is dark red and has a flavor of black-cherries that is not overly sweet. In a juicer or food processor, grind the ginger. Press through a fine mesh strainer to extract the juice. Layer oranges evenly in the bottom of bundt pan mold. Add herb springs in between the orange slices. Sprinkle and cover orange slices and herb sprigs with cranberries. Fill bundt mold with water; filtered water preferred. Freeze until ready to use. Run cold water on the back of the mold and the ring will pop out effortlessly.